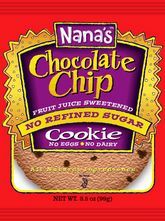 If you’re looking for a lighter snack, Nana’s does make smaller treats—cookie bars and cookie bites that come individually wrapped five in a box (the Chocolate Chippy Bar has 130 calories for whole thing; the Chocolate Chip Bites have 120 calories). These are good for a little dessert but aren’t as filling if you need a substantial snack. Nana’s also makes special omega-fiber cookie bars; I sometimes eat the apple harvest ones when I need a quick breakfast; they’re surprisingly filling for only 120 calories and 4 grams of fat. And they have a great apple and oat taste. They’re made with a very nutritious fiber mix that includes whole wheat flour, oats, wheat bran, psyllium, flax seed, millet, chicory root, fruit juice, and real dried fruit, no unhealthy oils or artificial flavors. I do like fattening cookies once in a while, but it’s good to know that I can indulge my cookie craving more often without guilt thanks to Nana’s!